Dean Saunders is looking for a first home win since the opening day. There’s no crisis at Chesterfield yet, says Dean Saunders - but the Spireites boss says the onus is on his players to end their current run of five games without a win. Saunders’ side have lost four of those games, the latest defeat coming against crisis club Blackpool - whose 2-0 win on Tuesday was their first at Bloomfield Road since January. But Proact boss Saunders insisted: “It’s not a crisis, we just need to pick some points up. “We got some points early on and it’s funny because if, last Saturday against Burton, the referee gives a foul on Jay O’Shea and a penalty, we’re fifth in the league. “We concede within a few seconds and lose another game, but it’s not a crisis. “It’s early season, everyone is jostling for position, you win three games on the trot and you’re in the top six. “But the players have got to pull themselves out of it. “I will help with that but they also have to do it themselves, otherwise I’ll have to change them. Blackpool’s win saw them dump Chesterfield’s next opponents, Crewe Alexandra, at the bottom of the table and Saunders added: “We’ve got to get ourselves off the floor ahead of Crewe on Saturday, there’s no time to think. “It’s a puzzle that I’ve got to try and resolve. “We’ll have a plan going there and part of the plan isn’t going a goal down in the first two minutes. It happened after half time on Saturday and it’s happened a few times earlier in the season where we’ve gone behind early on. “We’re not dealing very well with counter attacks so we have to get on the training ground again and go through things again. “You learn more in defeat sometimes; when you nick games sometimes you can sweep things under the carpet but you have doubts in your mind about certain individuals and the way the team’s playing. “But I’ve found in adversity, you learn more. 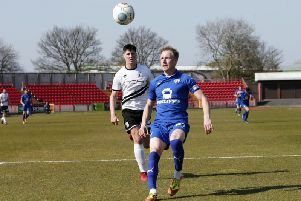 “It takes time to get a team functioning perfectly; it took time to get it right at Wrexham and Doncaster and eventually I’ll get it right here.